KGF director Prof. Robert Heinsch and Ms. Lotte Chevalier, LL.M. 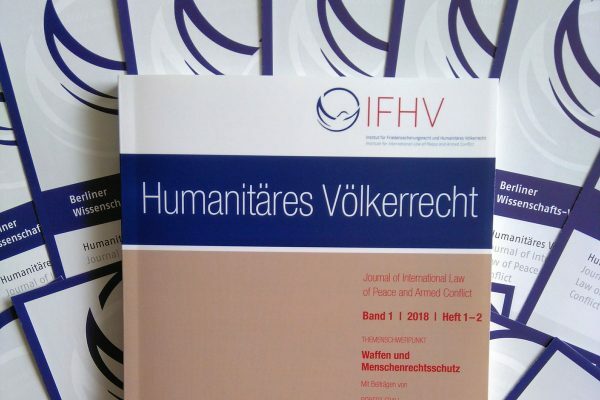 published an article on “The Educational Value of IHL Clinics: The Examples of Leiden and Bochum” in the December 2018 issue of the Journal of International Law of Peace and Armed Conflict (JILPAC)/Humanitäres Völkerrecht (HuV). The article examines the benefits as well as the challenges of setting up an international humanitarian law clinic in the traditional teaching environments of the Netherlands and Germany. It highlights the experiences and best practices accumulated during six years of letting students of Leiden University and Ruhr University Bochum successfully conduct research projects with project partners like the International Committee of the Red Cross, the Netherlands or German Red Cross, as well as different human rights NGOs and government agencies. It shows why students love participating in clinical legal education, and why this form of legal training not only enables students to apply their theoretical knowledge to practical situations, but also trains them in soft skills like teamwork, conflict resolution and time management. Lastly, it shows that through setting up IHL clinics all over the world and being part of an international IHL clinic network, the authors contributed to having real impact on the further dissemination, implementation and enforcement of IHL.